This is sort of a follow-up to last week’s post, Have a Picnic for Our Planet. Jeremy and I did have a picnic and we decided to make ours close to home. There aren’t many pictures because, well, we had just had our run/walk and came back to the apartment only to make our lunch. That’s right, forgoing our showers until post-picnic. So, there you have it. 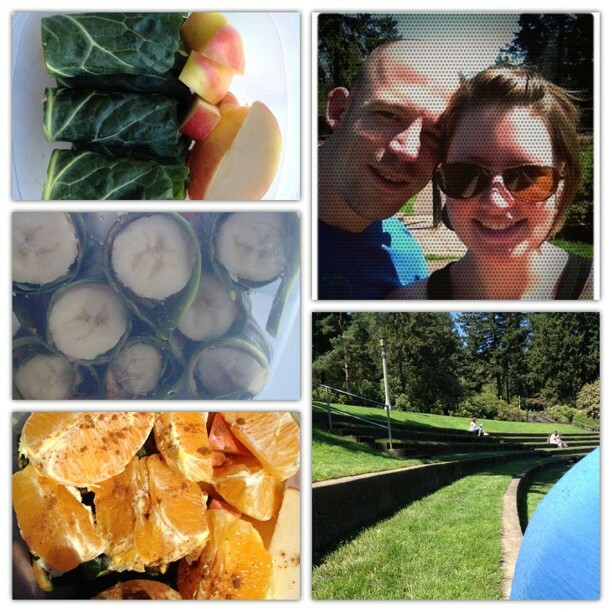 After packing our lunches, Jeremy with his PB&J (homemade marmalade) and me with my peanut butter banana collard wraps, we headed up the hill towards Washington Park, finding a nice sunny spot near the Rose Garden to spread out. We quickly discovered, we wouldn’t be sitting on the grass as it was very damp wet. It didn’t bother us any, as there was a nice cement ledge to sit on instead. We were in the lawn amphitheater area of the garden. The weather was gorgeous today and yesterday – with temperatures in the upper 70s and lower 80s with blue skies and full sun. Glad to have made good use of our outdoor time yesterday. 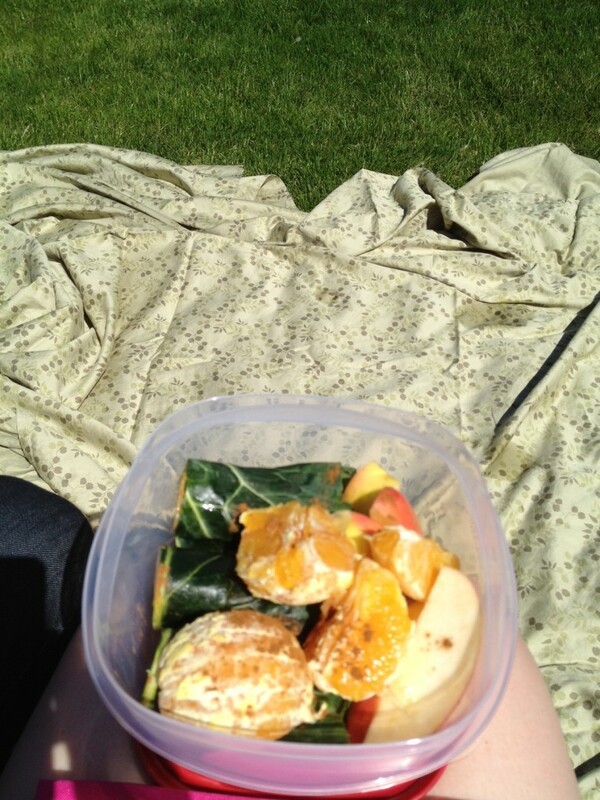 The collard wraps I made, turned out to be perfect for how hungry I was, how quick they were to make, transportable, and a delicious way to get fruits and greens in the same meal. I hadn’t eaten breakfast yesterday and we had just exercised so I kind of made a lot.